The basement of the Mattress Factory has seen some interesting things throughout the museum’s 32 year history. It’s been filled with candy for Rebecca Holland’s installation Glaze (2003) and most recently flooded with water for kanata (2008), a piece by artist Yumi Kori. But for two nights this summer, the lower level of the Mattress Factory will be transformed into an intimate concert space for the performance debut of Denver Broncos UK. Due to limited seating, two concerts will take place on Friday, July 31 SOLD OUT and Saturday, August 1, at 9:00 PM. UPDATE 7/31/2009: Friday's Denver Broncos UK show is SOLD OUT. A few tickets remain for the Saturday performance, so we recommend reserving your tickets now. Denver Broncos UK features Munly Munly, Slim Cessna, and Lord Dwight Pentacost, three musicians who have been working together for more than a decade as one half of Slim Cessna’s Auto Club (Alternative Tentacles). Though the music itself may be unclassifiable, the band’s songs are best described as dynamic, suspenseful, painful and beautiful. The sparse arrangements feature an array of instruments put to exotic use; guitar, autoharp, accordion, bowed banjo, and numerous percussive instruments; a landscape inhabited by haunted vocal harmonies. The sum of all parts reveals itself as a darkly-lit celebration of traditional American music, forged into a surprising new form. Both MF performances will feature set design and video projections by Owen Smith, and will be documented for future release by the band. To learn more about the Denver Broncos UK, visit http://www.myspace.com/denverbroncosusa. And like that, it's over. In case you haven't heard, we threw one major party last Friday! Thank you so much to everyone who attended and/or donated their time/money/muscle to help make the 2009 Urban Garden Party the most successful Mattress Factory fundraiser ever! We couldn't have done it without you. And for those who couldn't attend (or those who did and want to relive the experience), we just uploaded more than 100 photos to our Flickr stream. 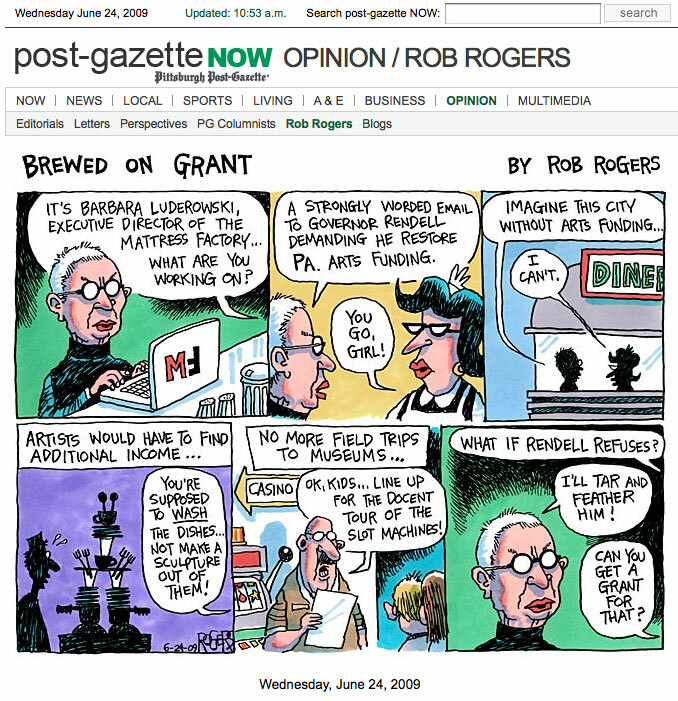 A slideshow is embedded below. You can access the entire album HERE. All photos are high-resolution (courtesy of John Altdorfer) and available as FREE downloads (personal use only, please!). And remember, all of this is to help support Mattress Factory exhibitions, programs and operations, so please consider leaving a little something in the tipjar. UPDATE 1: Do you have photos from your Urban Garden Party experience? Add them to the Mattress Factory Group Pool on Flickr! UPDATE 2: Check out this amazing Garden Party photo set by Jo Ellen Smith. UPDATE 4: This Flickr Set from Jeff Lantz has another 93 Garden Party photos. Awesome! Yikes! We're five days out from the 2009 Urban Garden Party, our big annual fundraiser. This year's event is going to be over-the-top and things are definitely coming together – the lobby is rapidly being converted to a graffiti-laden backstage hang-out for the VIP Pre-Party and the largest tent I've ever seen has been erected on our brand new parking lot! So, to get everyone in the mood and feeling this year's theme, we've produced this 2 minute Urban Garden Party trailer. We hope you like it. Please feel free to share with your friends! We did it! We're sweaty, but we did it! 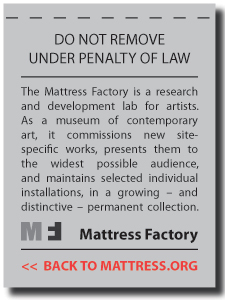 Regular readers of the MF Blog will know that April was officially declared the month of highlighting the Green efforts of the Mattress Factory. 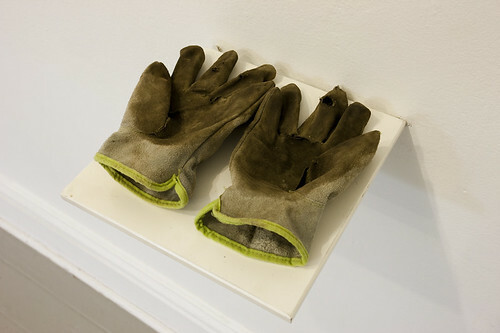 But because the Greening of the museum is an ongoing project, the Development Department (located on the third - and highest - floor of the MF administrative building) decided to partake in an energy usage experiment. We were curious about our potential impact–on both usage and the monthly financials–if we went the entire month of May without using heat or, more noticeably, air conditioning. Remember now how heat rises? So from May 1st through May 31st, all heating and air conditioning remained off. Kudos to Jeffrey, Emily, Claudia, Colleen and Shannon for sweatin' through May with me. Not only did we shave a wee bit from our carbon footprint, we were able to save a few bucks. Not a bad deal, really. What we weren't prepared for was the extreme humidity toward the end of the month. We survived two straight days of 88 degrees and nearly 100% humidity in the office. The dozens of windows offer an abundance of natural sunlight and gorgeous views, but the greenhouse effect is a little less than welcome on a warm, humid day. We did it, though! Yeah! Every little gesture makes a difference, so why not turn up your thermostat a few degrees this summer and grab a MF Green Membership with the extra cash you save? 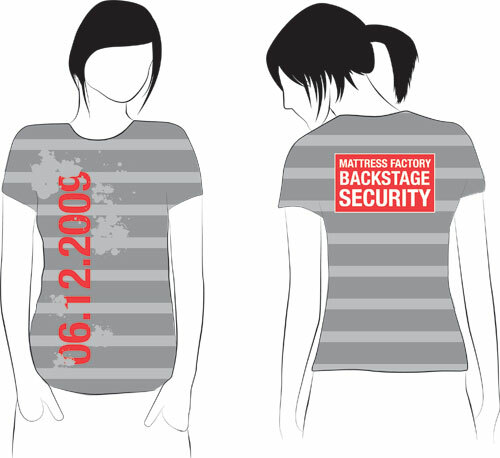 UPDATE 6/12/2009: We are now Sold Out of the Urban Garden Party Ticket + T-Shirt packages. We are in the home stretch with a little over a week left to go before the MF gets rockin' at the 2009 Urban Garden Party! Everyone here at the MF is having such a great time with this year's theme. MF Shannon & the rest of the graphic design team are working up some amazing rock-themed event signage and ads, while MF Owen & his team of installers are going all-out with lighting, video projections, multi-media and other decor. I didn't want the MF shop to be left out, so we decided to put together these limited edition graphic T-Shirts especially for the 2009 Urban Garden Party. These vintage black Alternative Apparel tees come in both Men's and fitted Ladies sizes (S, M, L, XL). They'll be on-sale for $20 during the event next Friday, so if you're planning to attend the Garden Party, make sure to stop in the shop and pick one up! And what's even better is that we're offering an extremely limited number as a Ticket & T-Shirt advance package. So act fast; while supplies last you can pick up a limited edition T-Shirt and a ticket to the Urban Garden Party for $100.00 even (A SAVINGS OF $10). The Urban Garden Party is a very important fundraiser for the museum that helps to continue to support cutting-edge artists and push artistic boundaries. All proceeds from the Garden Party and related merchandise go directly to support Mattress Factory exhibitions and programs. 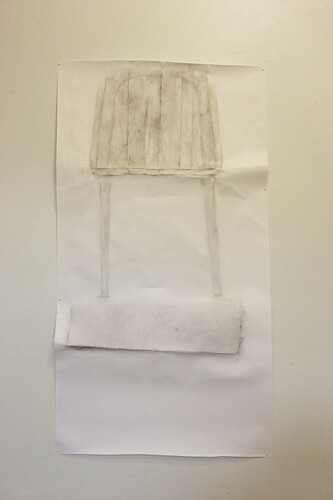 The following is a guest blog post by artist Kate Joranson. 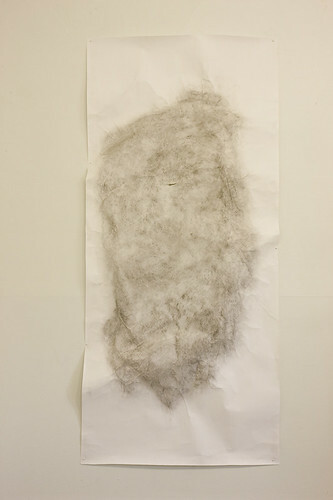 Kate is currently exhibiting three pieces in Gestures: An Exhibition of Small Site-Specific Works, which runs through June 21, 2009. Over the course of several days, she felt her way through Winifred Lutz’s Garden Installation here at the Mattress Factory. While wearing work gloves, I ran my hands over the brick, stone, and concrete walls, rusted metal, boulders, crevices, plants, etc. The gloves got more and more worn each day, thinning and softening. Holes appeared in the fingertips and several seams ripped. The gloves (and the paper rubbings) both connect me and remove me from the stones, plants, etc. My paper and leather surfaces take on the contours of what they come into contact with and absorb the space. I've also been thinking about pressure, and how the paper and the gloves become marked by the Garden. I'm captivated by how Winifred Lutz put the Garden in motion and then let go, allowing natural and human-made forces to take over. I wanted to find a way to attend to all these ongoing changes. Its interesting to have done this in the spring, since so much changes each day, and the birds are so active. It would be interesting to do this in each of the 4 seasons.